We arrange suitable trekking in a reasonable price. As you might know there are certain factors that determine the price of the trekking, no matter what types of trekking you are looking for. We feel happy to let you know all possible options. We are determined not to leave even a single stone unturned making your trekking memorable. All Trekking agencies claim to be the best. But, we invite you to examine our claim to win your confidence. If there is one thing that sets us apart from others, it’s our quality service. And this has given us a different identity in this business. Treks through the Everest or Sagarmatha National Park have inspired countless dreams and adventures, including visions of scaling the highest mountain on earth to those of getting a taste of the high mountains with a pack on their back and a camera in hand; ready to capture some incredible views of the lofty snowy mountain peaks that seem to grow in this region. Langtang valley is towards the north of Katmandu and just south of the Tibetan border. It is sandwiched between the main Himalayan range to the north and a slightly lower range of snowy peaks to the south. To the west of Langtang is Ganesh Himal with peaks between 6,000 to 7,000 meters. The name Langtang is originates from two different words ‘Lang’ and ‘Tang’. Lang means Yak and Tang means to follow. Kanchenjunga is the third highest mountain in the world and it is located in the eastern part of Nepal. Milke Danda is said to be the sanctuary for national flower, rhododendron. The foothills of these mountains ascend upward of 3,500mm rain per year, triple the amount of annual rainfall of western Nepal. As an effect of which jungle trails remain lush and green in the dry season. The whole trail follows the humidity forest along the Tamur river basin. Makalu is the fifth highest mountain in the world. It is quite near to the Mt. Everest , highest mountain of the world. This region is said to the true gift of nature as it is blessed with the diversity of natural beauty and culture. Very few trekkers visit this area as there are not enough tea houses. Moreover, it is isolated. It is one of the famous short trek which starts from Pokhara, a beautiful city. You will hardly find tourist on the way. This trek takes you through the forests and Gurung village. It offers you the chance to observe the wonderful life style of the local Gurung people. You will be enjoying the panoramic views of the mountains such as Annapurna, Dhaulagiri , Manaslu and Machhapuchare. The utmost point of this trek is Panchase hill and it is a kind of pilgrimage for Hindu people. This Himal has a triangular shape and its summit forms the western lower slope of mount Machhapuchhre. The mountain possesses two peaks and thus, it is named Machhapuchhre, which in English means ‘Fish Tail’. It is situated in the southern high point of the Annapurna Massif and its great skyline can be seen even from Phewa Lake in Pokhara. TheThis trek is specially developed for more inexperienced hikers or anyone who is interested enough to explore the countryside of Nepal . This area is really lacking behind in development. The Siklis area is very close to the Annapurna trekkin trails. It lies north-east of Pokhara. Very few lodges and guest houses are available on the route. Therefore, it is not difficult to understand that we set up a camp for overnight stay. The beautiful village of Siklis is on the brink of a hummock at the height of 2000m. Jumla is the remote area of Karnali zone which lies northwest of Kathmandu. The route is very much out-of-the-way and you can se various natural and cultural sites of Nepal. The snow-capped Himalayas reflected in the Rara lake gives you ideal feeling in the trekking. In summer, the rainfall is low. In winter, you see snow in the ridges surrounding the lake. You could see pine flowers in the autumn. 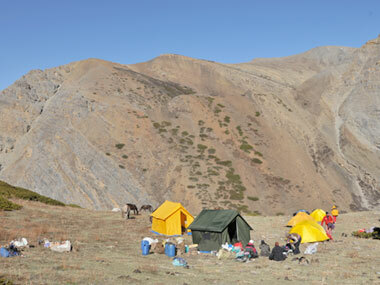 The permission to trek in Dolpo region was granted after 1989 only. This region lies to the west of Kaligadaki valley. Dolpo is situated inside the shey-phoksundo national par in mid western part of Nepal, behind Dhaulagiri massif towards Tibetan plateau. It offers opportunities to visit ancient villages, high passes, beautiful lakes, isolated Buddhist monasteries and also to experience the vast array of wildlife inhabitants. This remains a truly isolated corner of Nepal, time has stood still here for centuries as inhabitants of Tibetan stock continue to live, cultivate and trade. Tashi Lapcha Pass (5700m. )Teshi Lapcha is particularly dangerous because of frequent rock falls on its western side and the route through the icefalls is becoming technically more and more difficult due to the movement of the glacier. There are no facilities at all between Na and Thami: Tashi Lapcha is therefore a true mountaineering project. The Rowling area and Tashi Lapcha are technically closed to foreigners, but if you obtain a climbing permit for Ramdung, one of Nepal's trekking peaks, the Nepal mountaineering Association office will issue you a trekking permit for Rolwaling. Ba-Yul is said to be the hidden treasure of Dolpo. Few farmers and nomad settled down here in the 10th century after migrating from Tibet . You see the thick inhabitant of the people there with scattered villages and monasteries nestling among the mountains. Despite being a part of Nepal , it still culturally and economically tied to the Tibet . People are almost cut off to their southern neighbors due to the snow-covered passes. This is one of fascinating and equally difficult place to travel.